Ever wished you could easily transfer all your sketches, drawings, diagrams, brainstorms and mad musings from your notebook to the digital world? 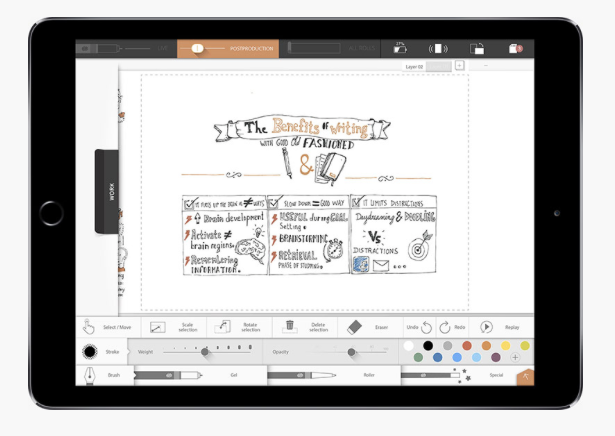 Well, at CES 2015 the iSketchnote was unveiled, a pen, app and drawing slate combo that can do just that, turning your offline scribbles into files that can be shared and edited on your iPad. The premise of the iSketchnote is pretty simple, attach any paper or book onto the Slate, draw away with the iSketchnote pen (or any other pen, the dedicated one just works a little better) and then your drawings are transferred onto your iPad. You can then use the iSketchnote app on the iPad to edit and enhance what you’ve already done. There’s a lot of customisation and different options, you can choose from different coloured covers for your slate and different options for your pens – take a look at the photo above. Of course this kind of tech isn’t brand new. Wacom’s Inkling does a similar thing, but it’s great to see these kind of capabilities being broadened, which will hopefully mean more affordable price points further down the line. This week we’re bringing you all the latest news, videos and gossip from CES 2015 in Las Vegas. Check out the CES 2015 page to keep up to date and subscribe to our YouTube channel to see hands-on news with our editor Holly Brockwell from the show floor.